“We nursed you back to health and now we need your help!” But unfortunately, some of her counterparts made sure help never came . . . even after thousands of women like my grandmother (Google: Nursing Sisters Port Dover) and Clara Barton went to Rochester, N.Y. and descended on the home of woman suffragist SUSAN B. ANTHONY (Clara Barton’s 6th cousin) to offer their support for a woman’s right to vote! What follows is a brief history of my family’s efforts to make lives better for men and women across the globe with a wartime love story. 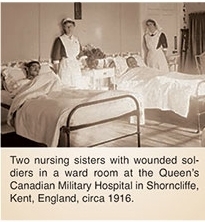 If you Google: Nursing Sisters Port Dover, you’ll see a book by Harry B. Barrett. In that book are pictures of my grandmother and her heroic nursing sisters during WWI, including one sister who was mentioned in wartime dispatches for her heroism along with a certificate presented to her by King George V. In spite ofher “valor in the face of the enemy,” after throwing caution to the wind because the love of her life had been killed in action, a woman was ineligible to receive the Victoria Cross! Heartbroken, this beautiful lady never married. during the brutally cold English winters. Carrie Chapman Catt also founded the League of Woman Voters and is most famous for her Congressional speech resulting in the l9th Constitutional Amendment that gave woman the right to vote in 1920! All this took place after Susan B. Anthony died in 1906 in Rochester, N.Y. where my grandfather baked his first loaf of BOND BREAD in 1915, resulting in 50 factories producing over l.5 million loaves of bread a day . . . a Horatio Alger success story which enabled my grandmother to help further woman’s rights. She was inculcated with a sense of moral responsibility by her family who emigrated here in 1720 and then moved to Canada because they were Loyalists to the King and the Church of England. Go to www.JohnEllis.com/NIH and you can watch an informative video which explains just how our E5 Water Machine works. And, just below the video, there is a green link to multiple NIH.Gov studies demonstrating the adverse health effects of deuterium in your water. “Hydrogen is the Fuel of Life” because, unlike ordinary DDW, by also changing Water Properties and increasing the Hydrogen Bond Angle between atoms (so it has more room to hold viruses and environmental contaminants in suspension) they can be eliminated from the bloodstream with almost immediate results (note typical cancer charts)! Small amounts of this water can treat millions of gallons of ordinary water (as the Municipal Video shows) including markers for disease, so they can be ﬂushed from a human waste lagoon or the blood stream along with heavy metals (Flint, MI: thousands of children have irreversible brain damage)!! water provides the “BODY ELECTRIC” energy that powers your heart (defibrillator to stop a heart attack, pacemaker)! Since it’s made by boiling and cooling, this energy is imparted to your food, unlike ordinary water that absorbs energy (from your food and body) to reach equilibrium)! Also, since DEUTERIUM studies (150 ppm) show it kills fruit ﬂies and disease-carrying mosquitoes, you don’t want to remove all the Deuterium Instead, INCREASE the Hydrogen Bond Angle (so it holds more contaminants in suspension along with Deuterium) and ﬂush Deuterium along with viral diseases from the blood-stream with almost IMMEDIATE results! Using our E5 Water Machine, you can make two types of DDW for PENNIES per GALLON . . . not $300 for a small bottle! This is done by heating and cooling water hundreds of times per gallon (not just once!) to change the properties of that water. We have 13 International Patents and 332 FDA Tests. You can judge the blatant dishonesty in the water industry using simple electrolysis. A child in science class could do that! With our 501(c)(3) non-profit Foundation, you can buy a machine and take a Tax Deduction! There are thousands of families around the U.S. who need our water machines—kids in Flint, families in poverty, etc. When you buy a machine, a portion of the proceeds go to this important humanitarian aid project.